Last Sunday (22nd July 2012) I drove up to Glascote Basin in Tamworth with Sally and the dogs to do a bit of boaty window shopping. I love my boat James. Although it’s 35 years old it’s in pretty good condition. The hull is sound and, now that I’ve had the cabin overplated, the top half is good for years to come. It’s a great liveaboard boat with acres of storage space and plenty of room for two people and two dogs. James has a good solid fuel stove with a back boiler feeding radiators down the starboard side so even on the coldest evening the boat is toasty warm (at the front). James is a good boat but it’s not a Hudson. 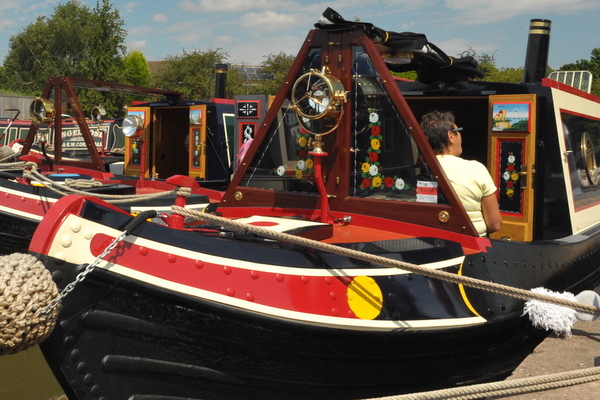 There’s not a huge amount of space in Glascote Basin, but every bit of it was filled with Hudson boats and their proud owners. The annual open weekend has been running for years. It’s an opportunity for both owners and Steve Hudson to show off their boats. And what fine boats they are. 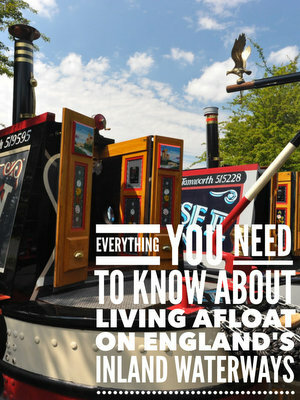 Steve Hudson builds traditional narrowboats. They are all Josher style with either well or tug deck. He favours engine rooms with boatman’s cabins behind but he also builds the more usually seen traditional narrowboats with the engine room at the rear. You can choose either their “B” or “C” specification and then you can add extras on top. The liveaboard boat I looked at was 62′ with a well deck, engine room and boatman’s cabin built to their higher “C” specification. The enhancements included a generator and a jacuzzi bath. I wasn’t over impressed with the jacuzzi but I loved the rest of the boat. I love to cook so I’m quite frustrated with James’ typical narrowboat size oven. One of the enhancements with this Hudson boat was a full size oven. Perfect for a Sunday roast on a crisp winter’s day on the cut. All of the woodwork inside the cabin was solid English oak. There were shelves and cupboards galore. In fact, owner Jeanne said that there are cupboards on the boat that she hasn’t used yet. You don’t often hear that about a residential boat. There were plenty of heating options on the boat. There was a Squirrel stove at the front, a boatman’s range in the cabin at the rear and radiators throughout fed by a Mikuni heater. All Hudson boats have spray foam insulation so with the on board heating options and effective insulation there’s no problem keeping warm even on the coldest winter days. I came away from the open day thinking that I really should start saving up. I calculated that, if I cut down on my evening tipple and don’t buy steak quite so often, I should be able to afford one of the higher specification Hudson boats in 2042! 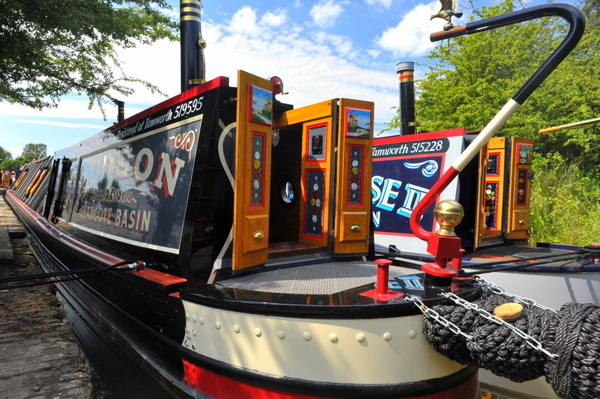 Prices start at ?67,450 for a 50′ Tame class narrowboat to ?135,000 for a 70′ narrowboat built to their “C” specification and with an engine room and boatman’s cabin. Looked at the spec for the ‘Rolls Royce’ boats on sale. A porta poti and curtain for a shower! Oak venier! Come on even botom end boats offer better than that. Don’t tell me they actualy find people who will pay seventy grand plus for them? What new boats offer a similar specification for the same price then? It appears to be a pretty good specification to me. Even the Mansfield Traveller toilet… which is a dunp through toilet, not a Porta Potti. And as for “who will pay seventy grand plus for them”, plenty of people it would appear. They have five boats in build at the moment. Not many boat builders are doing that well in today’s economic climate. My next door neighbour has a Hudson boat. He’s thrilled to bits with it.